Midwives are now delivering at Rex hospital for the first time in over a decade. Midwife-assisted delivery are at WakeMed in Raleigh, Duke Raleigh and Duke University Hospital. They are also in Charlotte, Greensboro or many other cities in NC. 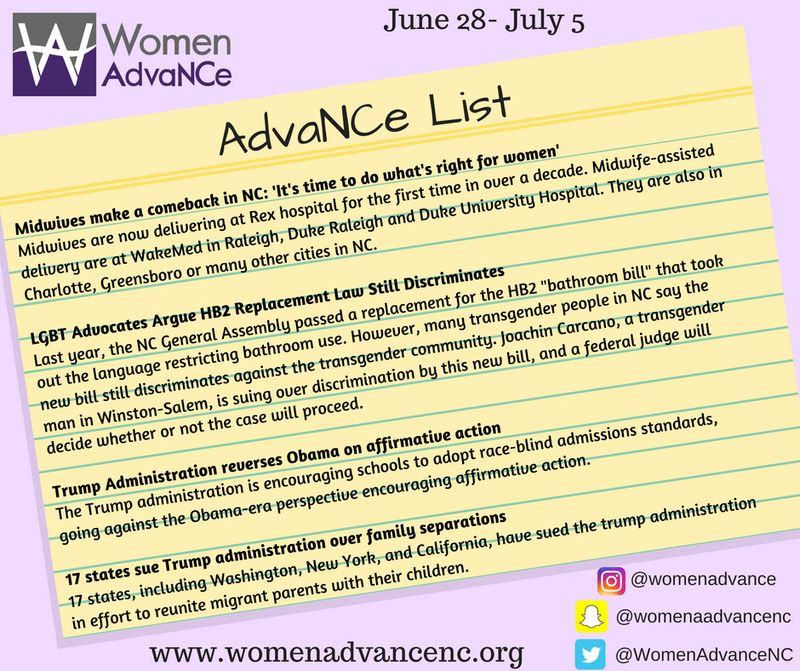 Last year, the NC General Assembly passed a replacement for the HB2 “bathroom bill” that took out the language restricting bathroom use. 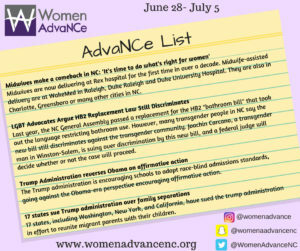 However, many transgender people in NC say the new bill still discriminates against the transgender community. Joachin Carcano, a transgender man in Winston-Salem, is suing over discrimination by this new bill, and a federal judge will decide whether or not the case will proceed. The Trump administration is encouraging schools to adopt race-blind admissions standards, going against the Obama-era perspective encouraging affirmative action. 17 states, including Washington, New York, and California, have sued the trump administration in effort to reunite migrant parents with their children.